You don't have to be paranoid, but observe your pig carefully and closely after bringing him home from surgery. While surgeries done on an otherwise healthy guinea pig, by an experienced and knowledgeable exotics veterinary surgeon, usually have a good prognosis and often a smooth recovery, there are some things that can go wrong, or at least set recovery back, once you get your pet home. Be alert for these and address them immediately. If a problem crops up, the quicker you spot it and address it, the less likely it will be to set your piggy’s recovery back or cause other damage to his or her health. ASK the vet what to expect, what to look for, and when, as your pig’s recovery progresses. Good vets will give you detailed discharge instructions, and either the vet or a senior tech will carefully go over what you need to do, and when, after you take your piggy home. Don’t hesitate to ask what may seem like a stupid or foolish question. There are no dumb questions when it comes to properly caring for a guinea pig postoperatively. It’s to be expected that your pig will spend the first few hours at home resting and probably hiding. That’s perfectly normal. But after a few hours, your pig will need to eat and if he or she is not doing so on their own, you will need to hand feed. Dogs, cats and humans can sleep for hours after surgery, and eat minimally for days postop. In a hospital setting, IV fluids can be administered. This won’t work for a cavy! Guinea pigs depend on a constant stream of food material passing through their GI tract, and dehydration affects how they feel and how well they’re processing their food to a much greater degree than it does for a dog, cat or human. Don’t be reluctant to disturb your pig if he or she hasn’t moved, eaten or drunk anything after several hours after coming home. You will need to provide postoperative medication; that’s a good time to offer water and handfeed (or forcefeed) soft foods such as Critical Care or a pellet slurry. Don’t let too many hours pass before doing this. Cavies need roughly 60 mLs of soft food (Critical Care or a pellet slurry) per kilogram of body weight DAILY if they are eating nothing on their own. 3 or 4 cc’s every now and again won’t cut it. Plan to give your pig 15 cc’s every 6 hours; more is better and more frequently (10 cc’s every 4 hours) is better still, if you can manage it. Less is needed if your piggy is eating some food on his or her own. WEIGH your pig daily to make sure he’s not losing weight, or if so, as little as possible. Most pigs lose weight going through a major surgery, and unlike humans, it’s very difficult for them to put it back on. Your goal should be to ensure that your pig loses as little as possible. Cavies generally won’t bother incisions, but a few will. 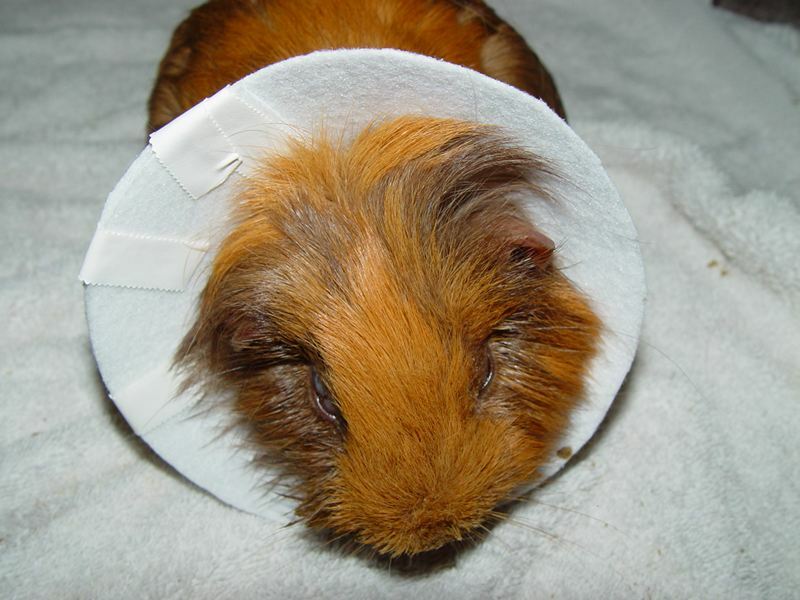 A standard e-collar will NOT work for a guinea pig. They are too stiff; they are too large for the pig to get in and out of pigloos or hide boxes; they prevent them from retrieving their cecotropes, which provide vital nutrients and vitamins; and perhaps worst of all e-collars freak them out. They can exhaust themselves thrashing around trying to get it off, exactly when they need to be resting and not doing a lot of running. Good exotics vets will not send you home with one. Gently pick your pig up at least twice a day for the first few days (this can coincide with medication administration) and take a close look at the incision. 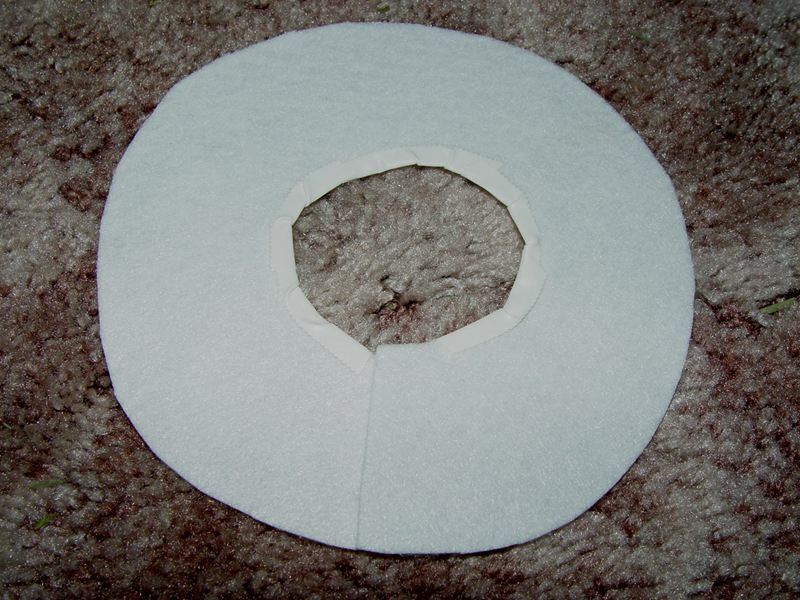 It's perfectly understandable (and right) that you don't want to hurt your pet or damage the incision doing this. Abdominal incisions are the hardest to deal with, because they are on the pig's underside. Try getting a clean hand mirror, and putting it on a table underneath a good light. Pick your pig up, gently but securely, being careful to support the area of the incision. Once you are sure she is secure, move to the table and very gently and carefully move your hand to expose the incision in the mirror. Make sure you keep firm control of your pet, however. Now is not the time you want him to make a jump for the table. As the pig heals, it will be easier to pick him up and hold him vertically to see the incision more clearly. All of these are signs of infection. CALL YOUR VET if you see (or smell) any sign of infection! Anything else that seems or feels “off” to you. You know your pet better than anyone else. A good veterinarian will take the time to call you back, listen to you, and explain what is happening and whether or not you need to do anything else, anything different, or bring your pig back in for a recheck. Some vets will offer (and some insist on) keeping your pig overnight, at least during the first night after surgery. Your pig will nearly always do better under your watchful, knowledgeable and familiar eye; in comfortable, familiar surroundings he has confidence in, and with your attentive care in handfeeding, observing for pain, any discharge, and behavior in general. The vast majority of the time it is far better for you to insist that your pig comes home with you after immediate postsurgical recovery at the vet. All that said, overnight hospitalization can be a viable option under very specific circumstances -- IF AND ONLY IF the facility TRULY has 24-hour care. That means experienced techs who do rounds every few hours just as they would during the day; a veterinarian experienced with cavies is on call and can be summoned in an emergency; the technicians know how to administer handfeeding appropriately (using a small syringe, not a huge one that can hurt a pig's mouth or dislocate a jaw), and the technicians know how to administer subcutaneous fluids. Many vet hospitals say they provide 24-hour care, but that can mean that the last tech leaves at 10:00 p.m. and the first arrives the next day at 6:00 a.m. That won't cut it. Even the best exotics veterinarians do not know your pet as well as you do, and do not know how to handle your particular pet as well as you do. There is very little that a clinic can do overnight to help support your pig's recovery that you cannot do, and in most cases you can do it better if you are committed to helping your pig through the surgery. You can monitor your pet more frequently; you can offer water more frequently; you can handfeed smaller amounts more frequently if needed. In the vast, VAST majority of cases, bring your pig home from the hospital the same day as surgery. Insist on it unless there are extreme mitigating circumstances. Some vets are in a position to take a post-surgical pig home with them themselves for a night or two. If you have confidence in your vet, you can be confident in this case that your pet will receive appropriate care. If you have a vet that is willing and able to do this, treasure them. This can be a Godsend in extreme or unusual circumstances.